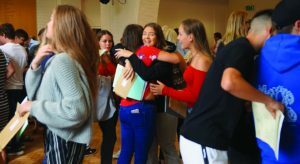 THERE was a new grading system but still the familiar sound of success at local schools, as students received their GCSE results. The new marking system, introduced as GCSEs are made more challenging, has replaced the usual A* – U format and replaced it with a system from 9 – U.
Pupils at Sir Williams Perkins’s School were said to “unfazed” by the new exam set up, with 34% of students achieving the highest grade, a grade 9. 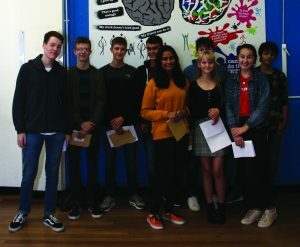 Students at Gordon’s School were enjoying the “gold standard”, as 94% of their students received grades of 9-4 – previously A*-C under the old system. At St John the Baptist’s school, 90% of their students achieved GCSEs at grades 9-4, with 43% of those graded as 9-7. 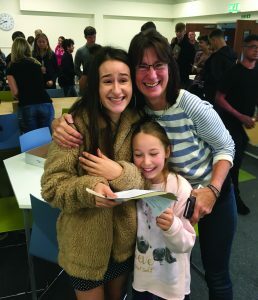 Students at Fullbrook School were also celebrating their results, with 85% achieving a grade 4 or above in English and 83% doing the same in Maths. Katie Moore, principal of the New Haw school, said she was very “proud” of students’ success: “Everyone has worked so hard to ensure students make great progress so that they achieve well and have the skills and qualifications they need to be able to take the next steps in their careers with confidence.